This collection has been updated with some 48,000 additional previously classified records held by the National Archives in Kew, London. 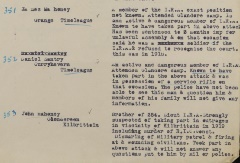 The transcriptions and images record life under martial law in Ireland following the Easter Rising of 1916 and include those who were killed, wounded, arrested, held in internment or tried by court martial. Some of the records also relate to army and police searches of homes and workplaces for guns, ammunition and seditious material. This collection consists of four 19th-century Irish histories and reference guides: the Album of Ireland, A Little Tour of Ireland, Ireland in Pictures and The Tourist's Picturesque Guide to Ireland. This census was taken on 31 March 1901 and records the details of more than 5million individuals. It was the first Canadian census to ask questions about religion, place of birth, citizenship and date of immigration. Search results include a transcript of the key details in the paper returns, plus a link to a digital image of the corresponding census form held at the Library and Archives Canada website, which will reveal further information about the household. This collection consists of 46 indexes containing more than 312,000 records of migrants from England, Scotland, Western Europe and Ireland between the late 1500s and early 1900s.